Colombian Caravana member, David Palmer, attended a roundtable meeting with the Peace Community of San José de Apartadó on 13 February organised by Peace Brigades International UK. In this guest post, he gives an account of some of the challenges the Peace Community face, as shared by German Graciano Posso, legal representative of the Peace Community; José Roviro Lopez, who leads the Community’s Fair-Trade activities; and Morelis Arteaga Guerra, one of the young farmers working with the cacao crops. 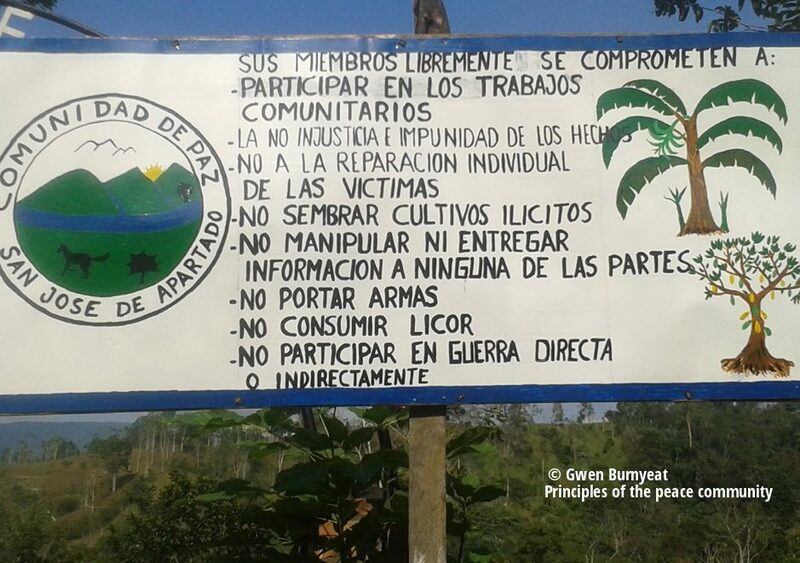 The Peace Community of San José de Apartadó, which was established on 23 March 1997, has maintained neutrality but is in constant danger due to the presence of illegal paramilitary groups and economic interests in the community’s land. It is a collective of over 500 peasant farmers with an overall population of around 2,000 living in various hamlets in the municipality of Apartadó, within the Urabá region of North-West Colombia. Since its creation in 1997, over 261 members of the Peace Community have been murdered. The Peace Community has been the subject of provisional (protective) measures issued by the Inter-American Court of Human Rights since 2000. It has also been the beneficiary of Court Order 164/2012 of 6 July 2012 issued by the Colombian Constitutional Court, requiring that adequate and concerted measures are taken to guarantee the life, security, and physical integrity of the Community’s members. In addition, San José de Apartadó town contains the largest police station in Antioquia and there is a military base. However, the Peace Community continues to face attacks. The Peace Community have welcomed the Peace Process but are concerned that there are no guarantees and there is no confidence the peace agreement will be implemented. The Community members stated that there are still many murders and since the beginning of the peace process there have been over a 100 human rights defenders and activists murdered in Colombia. The Peace Community members consider the situation is now much worse than in 1997 when the Peace Community of San José de Apartadó was formed and that if nothing is done the situation will get more difficult over the coming year. It is particularly troubling to note that despite the Peace Community having been in existence for over 20 years, threats to the Community continue to be received and the safety of its members is still not guaranteed. The Peace Community members assert that former President Uribe allowed the rise of paramilitaries. Peace Community members commented that there were 1,000 paramilitaries two years ago but there are now over 7,000. This increase has been achieved by an increase in recruitment since the start of the peace process, including the recruitment of 16 to 18 years’ old youths and older paramilitaries who have not demobilised. In the rural settlements of San José de Apartadó, the Community representatives stated that paramilitaries have recruited half of the young males and some young females. Community members assert that paramilitary recruits are given 700 Colombian pesos per month and are provided with a small pistol and a mobile phone. The new recruits are also provided with training. It was explained that members of the public have to pay 25,000 pesos each month to finance the paramilitaries. If a person owns a farm they will be required to pay 100,000 pesos per month. If a business has 2,000,000 to 3,000,000 pesos capital, the owner will be required to pay 150,000 pesos per month. The Peace Community members explained that the XVII Brigade of the national army sees the Peace Community as peasants and enemies. They state that there is a continued liaison between the army and the paramilitaries. Moreover, there is no response from the authorities to stop the paramilitaries and the recruitment of young people into their forces. The Peace Community of San José de Apartadó faces many challenges with respect to the safety of its members as a result of paramilitary activity, with the recent attempt to kill German Graciano Posso and José Roviro Lopez on 29 December 2017 one such example. The Peace Community had publicly warned a week earlier of a plan to murder its members. The five persons allegedly responsible for this attempt on the lives of these two Peace Community members are claimed to be members of the paramilitary group named Gaitanista Self-Defence Forces (AGC). Three of the persons responsible escaped, however, two of those involved were detained by the Peace Community members. They were handed over to the authorities but within 12 hours they were released. The authorities stated the Peace Community had held the two men for too long and had not permitted them to make telephone calls. The Peace Community of San José de Apartadó continue to work for peace in Colombia and one of its goals is to make more links with other communities.